Micromax launched the fourth handset in Doodle series. Dubbed as Canvas Doodle 4, the handset is now available online for Rs. 9,199. However, it is yet to be listed on the official website. The handset is likely to come with a stylus support. 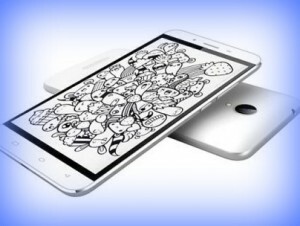 Mumbai: Micromax Canvas Doodle 4 handset sports 6 inch display but the resolution is 540 x 960 pixels which may be low. The handset is powered by quad core MediaTek MT6582M processor whose clock speed is 1.3 GHz. The processor is paired with 1 GB RAM and the internal storage provided is 8 GB. Memory can be expanded up to 32 GB via micro SD. There is 8 megapixel primary camera and 2 megapixel front facing camera on board. It comes out of the box with Android 5.0 Lollipop operating system. Connectivity features of the handset include WiFi, Bluetooth and WiFi. Other features include 3.5 mm headphones, FM radio and micro USB charging. It supports dual SIM. It comes packed with 3000 mAh battery. A couple of days ago, Micromax teased that Canvas Doodle 4 will be launched soon and so an official announcement is expected very soon. The first handset in this series was launched in 2013, the second in the same year and the third in 2014. This entry was posted in Launches, Tech on May 27, 2015 by Rakesh.